Railpictures.ca - Dave Burroughs Photo: Throttling up C&O 2522 west is about to knock down the light at the CN diamond in Hagersville. | Railpictures.ca – Canadian Railway Photography – photographie ferroviaire Canadienne. 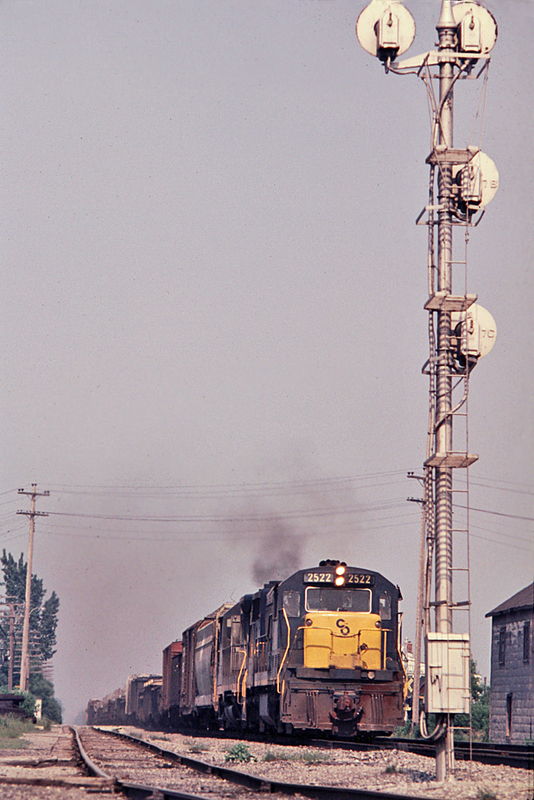 Caption: Throttling up C&O 2522 west is about to knock down the light at the CN diamond in Hagersville. Bruce, this is the only shot of this train I took. I can find only one picture taken in Hagersville from the north side of the tracks and this is it. Don’t know if those are CWR cars or possibly pipe. That would definitely be a telephoto shot. The train makeup is also intriguing. I presume it is mainly gondolas and the pole line in the background in combination with compression of the telephoto, makes it look like a welded – rail train. Did you happen to take another shot of the cars or going away ? ?